A new edition of the blockbuster book that revealed the top-secret findings of the US government about UFOs. Throughout the 1950s and 1960s, while publicly dismissing the existence of UFOs, the United States Air Force was engaged in a secret program for evaluating every report of unidentified flying objects. 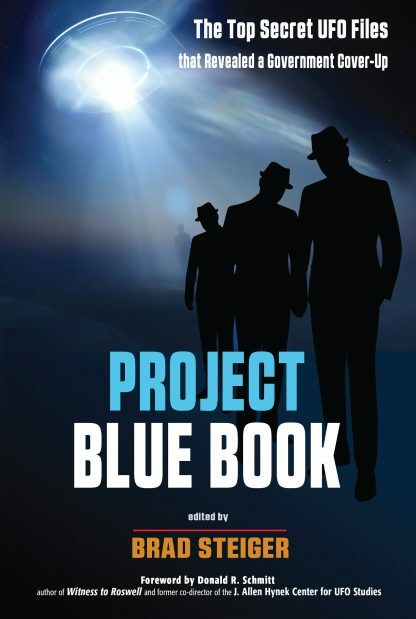 Under the code name, Project Blue Book, the Air Force analyzed over 13,000 incidents. The goal of this enterprise was threefold: To determine the cause for each UFO sighting, to assess the security threat for each incident, and to determine how the United States could obtain or create the technology used by UFOs. This book, based on secret files obtained through the Freedom of Information Act, includes accounts of seven of the most important USAF enquiries-- among them the story of the nights the White House was buzzed by UFOs, the mystery of the Lubbock Lights, the full story of Captain Mantell--Ufology's first martyr, and the startling conversion of the prominent astronomer, J. Alan Hynek from UFO skeptic to believer. This is startling and fascinating book that uncovers not only the anatomy of a government cover-up, but also provides stark and chilling evidence that we are not alone. It is all here, government documents, the testimony of scientists, the military, pilots and citizens all over the country who have witnessed UFOS. Brad Steiger (February 19, 1936 � May 6, 2018) was an American author of fiction and non-fiction works on the paranormal, spirituality, UFOs, true crime, and biographies.